When it made its debut back in 2004, the first BFD version got a lot of attention because it offered a huge sound bank with many velocity layers and the possibility to create your own drum mix using different sources: close mics, overheads, room and PZM mics. BFD is now available in version 2, offering even more drums and velocity layers, more processing capabilities, a virtual mixer, etc. The manufacturer has already launched a lot of additional sound banks, among which are some original libraries like an 8-bit Kit (a sound-design trip), Japanese Taiko Percussion and Zildjian Digital Vault (34 cymbals!). With Superior Drummer, BFD is one of the leaders in its category, offering endless possibilities but with a steep learning curve for beginners. Price: €199. Like its name says, this is a BFD light version in terms of price, memory requirements and features. The product includes only a selection of samples from the sound library of the big brother, and the number of velocity layers might prove a bit limited for certain applications. However, with 1,500 grooves, 40 presets, 15 processing features and its affordable price (€79), it's a very attractive choice if you're looking for your first virtual drums, even if competition is hard in this price range where we have Toontrack's EZDrummer and Native Instrument's Studio Drummer and Abbey Road among others. BFD's main competitor! At first there was the "Drumkit From Hell" sound bank available on CD. Afterwards, the virtual "Drumkit From Hell Superior" was created to counter BFD's huge success. Toontrack relies on big names (Morgan Ågren who played with Frank Zappa and Tomas Haake from Meshuggah), uses an internal bounce system to save computer RAM and offers a versatile percussion kit. With version 2, "Superior Drummer," you can buy some additional sound banks like Roots SDX (sticks, brushes, mallets and rods), Metal Foundry, New York Studios, Music City USA, or Custom & Vintage. Together with BFD, the heavy-weight in its category. Price: €259. 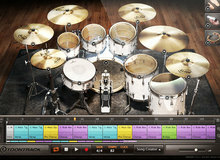 EZDrummer is the affordable version of Superior Drummer. Its goal is to provide ready-to-use sounds and grooves at a modest price (€79). Even though the original drum kit can't really hide its age, Toontrack had the clever idea to regularly offer additional drum kits covering a wide range of music genres. So you'll find some classic banks like Metal Machine, Jazz, Nashville, or The Blues, and also more original banks like Claustrophobic (for RnB and hip-hop) or the Twisted Kit (from the former Tom Waits' drummer during the "Rain Dogs" era). The ease of use and the available additional banks make it a must-have for home-studio owners who want to achieve good results without too many headaches. Addictive Drums is the third musketeer when it comes to virtual drums. XLN Audio doesn't try to compete head-to-head with BFD and Superior Drummer in terms of sound-bank size, but rather focuses on intelligent sound variations based on different processing possibilities and mix presets, which require almost no additional processing to fit modern productions perfectly. The last couple of years they have added some interesting sound banks, especially Modern Jazz Brushes (based on samples and sound synthesis), a Metal pack, a Funk pack and Session Percussion. However, we're still eagerly waiting for version 2... A good compromise between entry-level sound banks and the heavy-weights. Price: €179.95. The R&D team had its first success with Trigger, their drum-replacement software solution, before launching its own virtual drums including MIDI grooves and kits for every music style from jazz to metal. 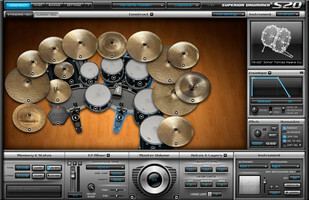 The sound bank offers ready-to-use, pre-mixed drum kits and also "signature" kits inspired by renown artists and recordings: Steely Dan, Led Zeppelin, Nirvana… Noteworthy are also the five Urban/Dance/House/Electro kits, as well as the possibility to stack different samples directly within the software. Price: $199. Native Instruments' Abbey Road Drums series revisits the mythic London studio with five sound banks spanning over several decades: 60's, 70's, 80's, 90's (Modern) and pre-50's (Vintage). The sound is very characteristic, with some special "revival" features (recording with only four mics, gated reverb, cloths on the heads, etc.) and a very careful production. The presets, processing and grooves allow you to get a quite authentic drum part with a few clicks. Sold separately for €99. Following the Abbey Road Drummer sound banks, Native Instruments launched a more versatile sound bank including three complementary and classic drum kits (rock, pop and metal). 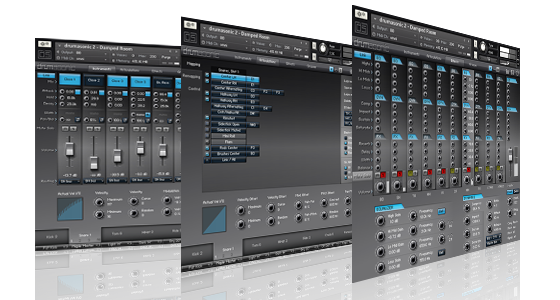 It has everything you need: grooves, processing options, presets... at a fair price (€149). However, we miss some additional sound banks. 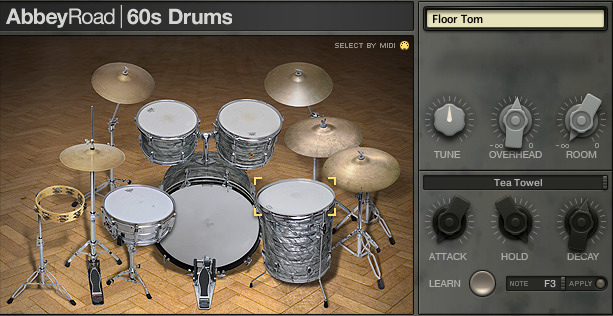 As the name implies, Urban Drums are virtual drums dedicated to hip-hop, nu-soul and even electronic music. The samples (over 2000) were recorded using three different mic positions and can be mixed with synthetic sounds. 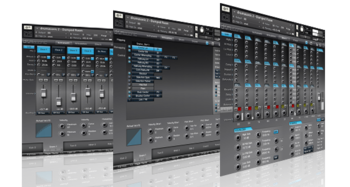 The sound bank, which uses the UVI Workstation 2 engine, offers not less than four round robins and up to 20 velocity layers for each sample. Price: €69. The first argument of the Bluenoise Drummix Metal 1 and Drummix Rock 1 sound banks is their price: €37. And what they offer is quite astonishing for the price: a Ludwig Fab Four kit and a Tama Artstar 2 kit recorded with first-class gear, even if the samples are raw and you'll have to process them in your sequencer. The only con is the Drummix kits are only available for Windows... and we're still waiting for the 9 additional banks. Volko Alaturka Drum is quite special: it allows you to incorporate rhythms from the Middle East and North Africa into your songs, but with a somewhat "western" sound. Specially noteworthy are the two Gretsch kits (900 MB of samples with 10 velocity layers per sample), as well as the drag 'n' drop ability for sequencers, the humanizing functions and the processing (reverb, limiter). 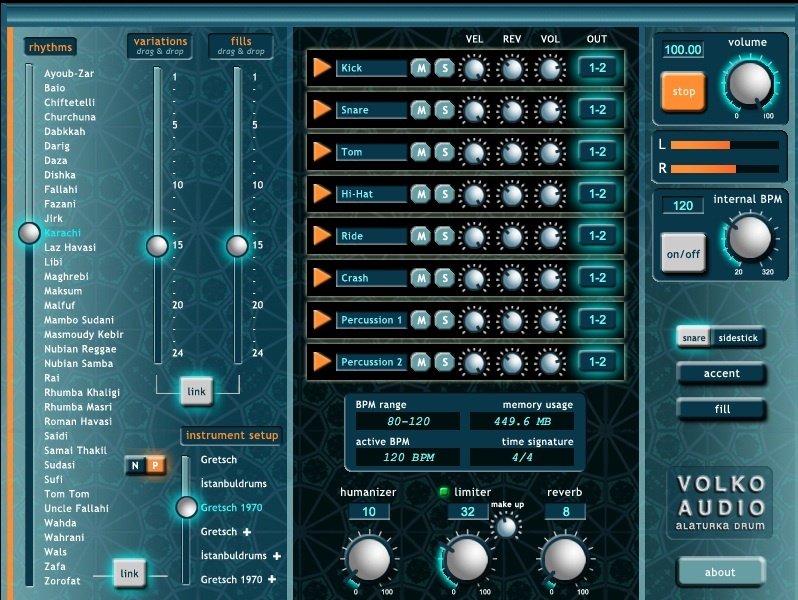 And let's not forget that it is compatible with VST, AU and RTAS under Windows and OS X. Price: $119. Originally, Jamstix was an "intelligent" groove generator supporting the virtual drums available at that time: BFD and DFH. Currently in version 3.5, the software has grown up and now includes 1.7GB of samples, a mixer with processing, 70 styles, 17 virtual drummers, and still allows the control of third-party virtual drums. The GUI looks old but the program is still quite unique in its category and allows to create new grooves based on rhythms collected here and there. Price: $99. MT Power Drumkit 2 belongs to the challengers that will please users disappointed with the heavy-weights. The main asset of this virtual drum kit is that it offers sounds that are already processed (which will be a disadvantage for some!) that can be easily integrated in a typical pop/rock production. The manufacturer promises bass and snare drums that really cut through the mix. Also note that you get one compressor for each channel, plus MIDI grooves. The samples were recorded slightly different than the other virtual drums: instead of having the drummer play each drum separately, they asked the drummer to play the grooves and extracted the samples later. VST and AU support under OSX and Windows. Price: $50. DrumCore is special because it includes samples and MIDI grooves played by renown drummers, and also because it provides 24-bit stereo loops. You can also import REX2, WAV, AIFF and SD2 files, as well as ACID loops. The standard version is sold for $249, while the Deluxe version costs $650 and includes many additional sound banks. Mac and Windows support. Free trial version available. Luxury offers only one drum kit but several bass and snare drums. The manufacturer mentions that the drums were recorded in a "pushing" room. There are brushes, mallets and rods, while the snare comes with or without strainer. Round robin is also available. You also get mix presets, many processing options (EQ, compressor, transient designer, etc. ), grooves, 30,000 samples and effective RAM management (unused samples are suppressed). The library works with Kontakt Player or Kontakt Toukourt. For €99, Luxury is very comprehensive. A dangerous outsider! Vir2 clearly bets on quantity with its Studio Kit Builder: 130 pieces for 50 drum kits! It goes without saying that the product covers a wide range of music genres, from jazz brushes to brutal heavy metal. The manufacturer highlights several mic positions and the possibility to make your own mix. And don't forget the grooves provided. However, its price tag ($199.95) is higher than average – the price of abundance! VST, AU and RTAS compatibility under Windows and OSX (using Kontakt's audio engine). In the "Virtual drums that are the most..." series, it's time to introduce "The most... expensive"! To get your hands on the "Platinum HD" version of Ocean Way Drums you'll have to pay $1995. What could justify such a price? The 96kHz recordings by Allen Sides and Steven Miller, the mix presets, the 19 channels plus seven bass drums and 80GB of samples stored on a 7200 rpm hard drive. 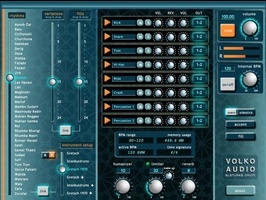 The product is compatible with VST, AU and RTAS under OS X and Windows (using Kontakt's audio engine). It has no drawbacks, except for the price, which is much higher than average, even for the Silver Edition ($395, 30GB samples). Drumdrops are quite new, but they are providing very good Drums Multi-Track, stems, drum loops, drum samples and single hits. We really like the two first Kontakt 5 packs, the Vintage 1963 Premier Outfit 54 kit and the original Rogers Big Ro Dub Kit. It includes more than 1 GB of data, it's compatible with V-Drums, Yamaha DTX900, Addictive Drums, BFD and Superior Drummer Mapping, Also the price is very good, 62$ each !